Okay, so maybe that isn't the situation that every HCC reader finds themselves in, but is exactly what occurred when Oxfordshire-based install outfit Overture were employed to deliver a home theatre. And having seen the bigger basement space, they quickly persuaded the owner to change his thinking, especially when it was pointed out that by adding a bar at the rear of the room they could still fit a socialising/party area. The basement, after all, was some 13 metres long. With the decision made, the hardware was specified. 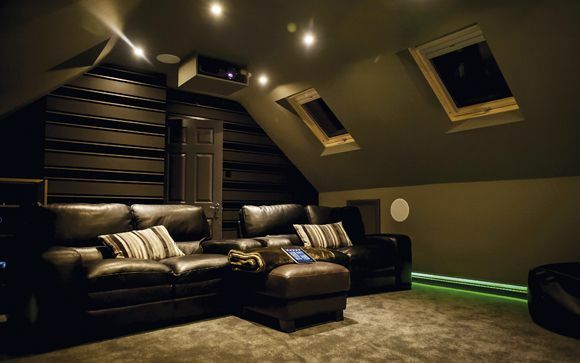 Key to this room's appeal is its forward-thinking attitude – a 4K-capable Sony VPL-VW1000ES projector is ceiling-mounted above and behind the second four-seat tier of Front Row cinema recliners. The projector is fed by an Oppo Blu-ray player, although it's safe to assume that the owner will upgrade to a 4K source as soon as one becomes available. At the other end of the room images are displayed upon a fixed four-metre acoustically-transparent screen from US specialist Seymour AV. For audio, the kit rack combines Parasound Halo amplification and Integra processing. This feeds the 7.2 speaker array from M&K Sound. The surround channels are wall-mounted, while the rears are housed discreetly in the ceiling as the back wall is simply too far away. With the basic structure of the room (within a property built in 1740) unable to be altered, Overture applied acoustic treatments to the walls and ceilings to reduce sonic anomalies, including the bountiful use of fabrics. Everything is colour-matched to look modern and distinctly classy, and the ceiling-recessed lighting array, downlights and floor-level illumination – as well as the hardware and automated blinds – are all controlled via a Control 4 system. The owner, I'm told, is delighted with the finished result, not only in terms of movie playback but also for listening to music. And with table football and a well-stocked bar also on offer, we doubt he spends that much time in the rest of the house.